The New Forest at War documents the social and military history of this unique area of Britain during the Second World War. The Forest was on the front line in the build-up of D-Day in June 1944 and with over 100 photographs and many first-hand accounts it provides a fascinating snapshot of life at this critical time in the nation’s history. The author’s interest in the New Forest and its wartime history evolved from a chance meeting with a veteran in Ringwood. The veteran, who had travelled from the USA and was visiting his former wartime airfield at Stoney Cross, told stories of his experiences and how important it was to remember those who never returned. 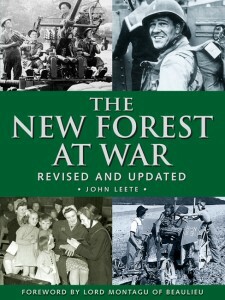 The New Forest at War was John Leete’s first book and he has since written several well respected titles on the theme of Britain’s Home Front during World War II. He is a Hampshire based Historian and he enjoys collecting and displaying Home Front memorabilia as well as writing about and giving Talks on the subject of wartime Britain.